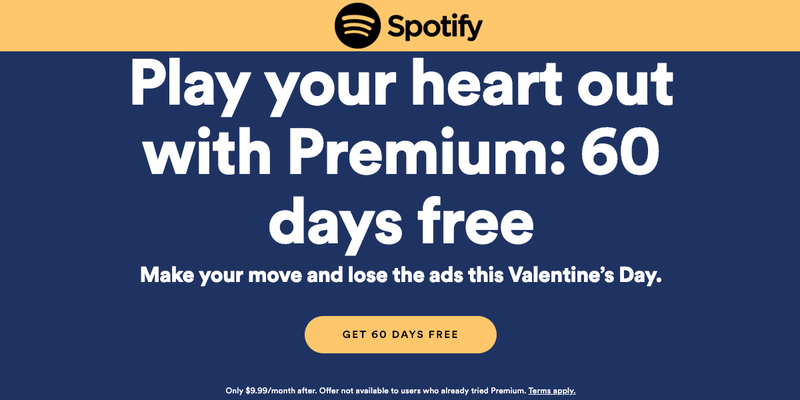 Spotify is currently running a Valentine's Day promotion, which allows customers to enjoy 60 days of Spotify Premium for free. With Spotify Premium you can download your favorite tunes for offline consumption, skip and play any song you like and enjoy your content ad-free. Keep in mind that this offer is only available to users who have not tried Spotify Premium in the past. After the 60-day Spotify Premium trial, you'll be required to pay $9.99 per month to continue to use the streaming service. 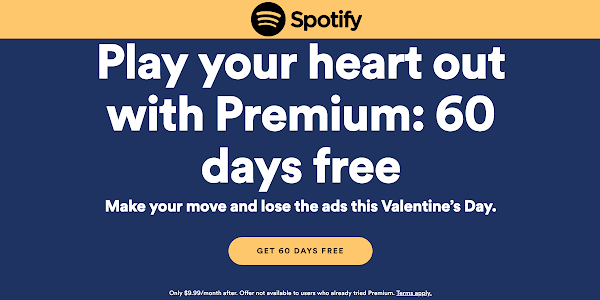 Usually, Spotify offers 30-days of free premium service to their new customers, so this is an additional $9.99 value over that deal in any case. Currently, this deal appears to be available to customers in the United States and in Canada, but be sure to follow the link below and let us know if the promotion is also available in your region.